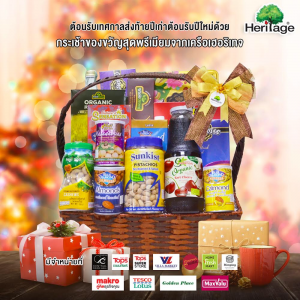 Heritage Group, Thailand’s leading premium natural food and beverage producer, delivers happiness during the New Year celebrations with high quality products varieties comes in a beautiful Heritage Hamper starts from 829 baht – 3,390 baht. The Heritage Hamper includes products from Heritage, premium nuts and dried fruits; Blue Diamond, premium almond and almond milk by Almond Breeze from California; Nature’s Sensation, natural dried fruits and juices; Nut Walker, premium nuts and snack range; Sunkist Pistachios, premium quality pistachios; WonderPuff Popcorn, premium quality popcorn with nuts; Françoise Gourmet Cookies; Mangiatorella, Italian imported mineral water; Whole Grown, healthy food products; Centoneze, organic extra virgin olive oil, etc. The Heritage Hamper is now available for the New Year celebrations from now on until 15 January 2019 at Central Food Hall, Tops Market, Tops Superstore, Gourmet Market, Villa Market, Makro, Rimping Supermarket, Maxvalu Supermarket, Golden Place, and Tesco Lotus.